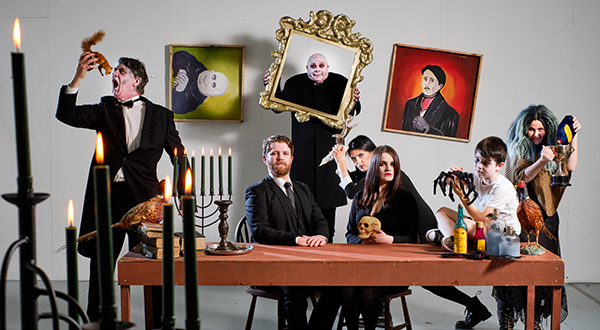 ENNIS Musical Society is setting the scene for a musical with a difference this month as it stages The Addams Family A New Musical. Featuring an original story this show has all the spooky characters audiences will know and love from the two films. 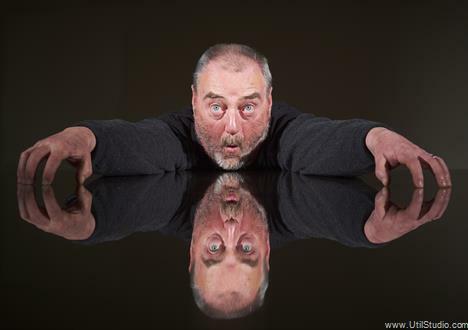 Based on an original story and score the show sees the head of the Addams clan, Gomez, played by Galwegian Alan Greaney, placed in every father’s nightmare, when his only daughter, Wednesday, played by Aoibheann Malone, has grown up and fallen in love. This musical comedy sees Wednesday, the ultimate princess of darkness form an unlikely bond with a sweet, smart young man from a respectable family – a man her parents have never met, Lucas Beineke, played by Ennis’ Daniel Lynch. And if that weren’t upsetting enough, Wednesday confides in her father and begs him not to tell her mother. Now, Gomez Addams must do something he’s never done before – keep a secret from his beloved wife, Morticia, played by Ailish O’Flaherty. Everything will change for the whole family on the fateful night they host a dinner for Wednesday’s “normal” boyfriend and his “normal” parents. The fun filled musical with Latin flavoured choreography and high energy will see a host of Addams family ancestors come to life as we meet all the Addams clan who came from the old country and settled on a plot of land in what is now New York’s Central Park. Ennis Musical Society chairperson Ciara Lynch said this year the society is delighted to welcome so many new faces to their extended family with a number of new cast members taking on leading and chorus line roles. “This year’s show has plenty for all to enjoy and it won’t disappoint anyone that is a fan of the movie. This weird and unusual family offer up some fabulous musical numbers and as each character fights with their own struggle it has so many laughs,” she said. 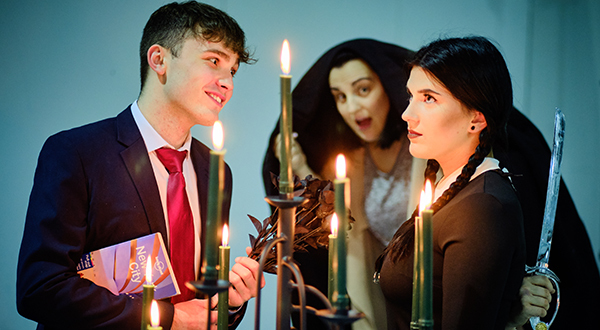 Daniel Lynch as Lucas Beineke, Sarah Griffin as Alice and Aoibheann Malone as Wednesday, in rehearsals for the Ennis Musical Society’s forthcoming production of The Addams Family Musical. This show comes off the back of the success of Sister Act The Musical, which saw the society nominated for two national Association of Irish Musical Societies (AIMS) awards. “We were delighted when our Front of House team, headed by Rosaleen O’Sullivan and Kathleen Shannon won the national award in our category for best front of house production, while our own Sarah Kenny was nominated for best supporting actress for playing Sr Mary Patrick in Sister Act. Sarah joins us again this year to play the part of Alice Beineke, the mother of Wednesday’s love interest. “As our award winning front of house duo also returns this year audiences can expect the foyer of Glór to be as spooktacular as it will be on stage so they can experience the full effect before, after and during the show,” Ciara continued. This year the society has also elected a new president, Pat Buckley, who has been involved with the society in one way or another since 1960. Pat has taken on the role since the passing of Ennis Musical Society president Kaye Gaynor who held the position since 2014. This is Ennis Muical Society’s 62nd show and it is being directed by Jessica Bray, with award winning musical director Shane Farrell, choral director Eilís O’Neill, and choreographers Pamela McGlynn and Edina Erdei. This year’s show is a real theatrical production and will see the Glór stage transformed as it becomes an eerie graveyard and welcomes the audience into the creepy Addam’s Family mansion. Joining the cast this year is also nine year old Tiernan Kilroy from Ennis, who takes to the stage for the first time with the society as Pugsley Addams, while Ennis’ Rachael Culligan takes on the role of Granny Addams, and another local man, Joe Moran plays the role of the non-verbal Lurch. 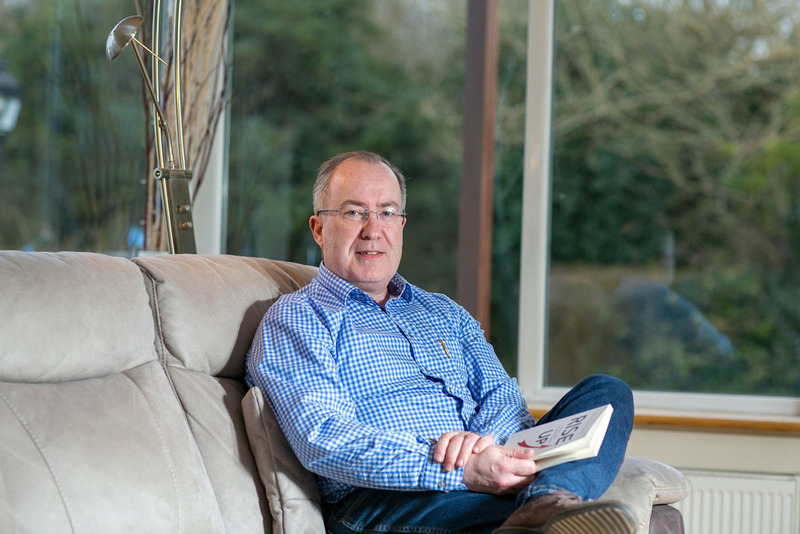 Other leading roles include Fester Addams, played by Patrick Kelly a Nenagh resident, and performing his third leading role with the society is Limerick man Patrick Woulfe who plays Mal Beineke. The Addams Family A New Musical is running in Glór from Wednesday March 27 to Saturday March 30 with nightly performances at 8pm and a matinee on Saturday at 2.30pm. Booking details are available from the theatre.